The reverse hollowed out; on a later square black marble base inscribed 'ANTONY 1ST EARL OF SHAFTESBURY RYSBRACK'. Very minor chips and firing cracks. Supplied to Anthony Ashley Cooper, 4th Earl of Shaftesbury (d. 1771), for St. Giles's House, Dorset, and by descent at St. Giles's. 'J', 'St. Giles's House, Dorsetshire - I', Country Life, 13 March 1915, p. 338 (illustrated in situ in the Entry Hall). M.I. Webb, Michael Rysbrack, Sculptor, London, 1954, p. 179, 224, fig. 87. London, National Portrait Gallery, Samuel Cooper and his contemporaries, Daphne Foskett, ed., 1974, no. 127, pp. 60-61. Anthony Ashley Cooper (1621-1683) was a man of great talent and ambition who rose from being the son of two wealthy gentry families in Hampshire and Dorset to become Lord Chancellor and one of the most influential political figures of his day. An intimate friend of Locke, he was a man of wide intellectual interests. His remarkable career came to an end when his support of the Duke of Monmouth was revealed, and he fled to Amsterdam where he died less than two months later. The present bust of Shaftesbury, executed around the year 1732 by Rysbrack, is a posthumous portrait based upon a miniature by Samuel Cooper which was, itself, commissioned around the time that Shaftesbury was made Lord Chancellor in 1672 (for a discussion of the miniature see Cooper, loc. cit.). The terracotta served as a model for the marble bust which adorns Shaftesbury's monument in the church at Wimborne St. Giles. A drawing by Rysbrack of the monument exists in The Soane Museum, London. Michael Rysbrack was the leading sculptor and portraitist of his day, and one of the most important artistic personalities in Georgian England. 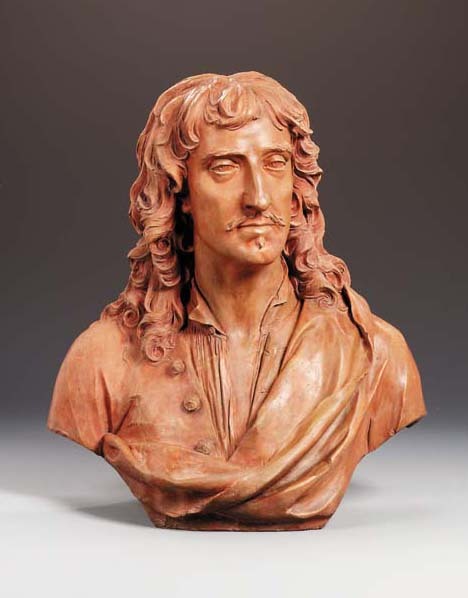 In the case of the present terracotta, the positioning of the head, and the general facial features relate quite closely to Cooper's miniature. However, Rysbrack manages more successfully to convey Shaftesbury's considerable charisma while simultaneously suggesting a certain ruthless determination. The luxuriant hair and open-necked shirt - which differs from Rysbrack's drawing in the Soane Museum where he is depicted dressed as a Roman - strengthen the image of Shaftesbury as a formidable personality of the Restoration era.